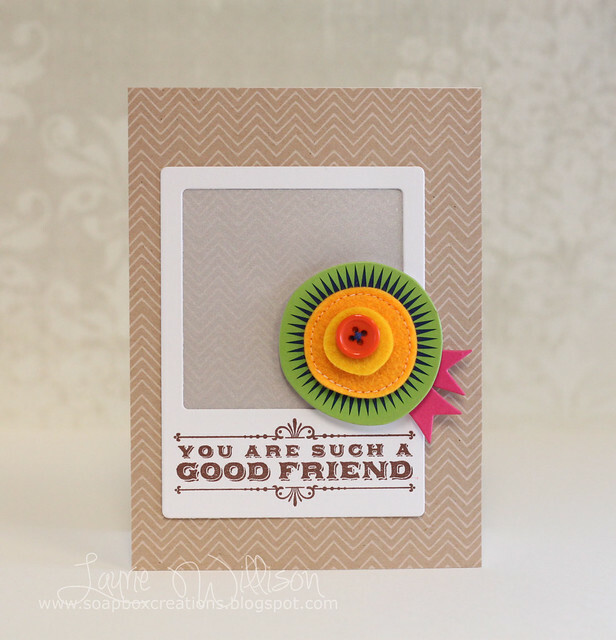 I played around with the weld button on the Cameo again this week and came up with this fun card for Retro Sketches.. I layered the cut with some cute Echo Park paper. I used my CutterBee bug to make the little perforated tab. I bought those things YEARS ago for scrapbooking and am thrilled to actually use one today! I put it all on this Limeade Ice card base. I wasn't sold on this color until my sweet Audrey sent me some and I think I will be buying. I love this bright green!! Check out what Arielle, Kasia and Wendy have for us over at the Retro Sketches blog. I hope you can play along too! TGIF!! Right? It's been a super busy but fun week and now we are headed here into another super busy but fun weekend! 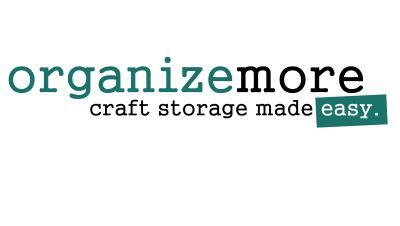 One of my besties is moving and we are going to help. Several of us are taking food so I have come cooking to do too! So I am here today with my card for CAS-ual Fridays. The theme this week is called...Toot your own horn! Basically, you need to make a card inspired by the banner of your own blog. I think it kinda looks just like my banner huh? :) I added in a popped up bracket that I cut with my Cameo. Other than that? Easy peasy! 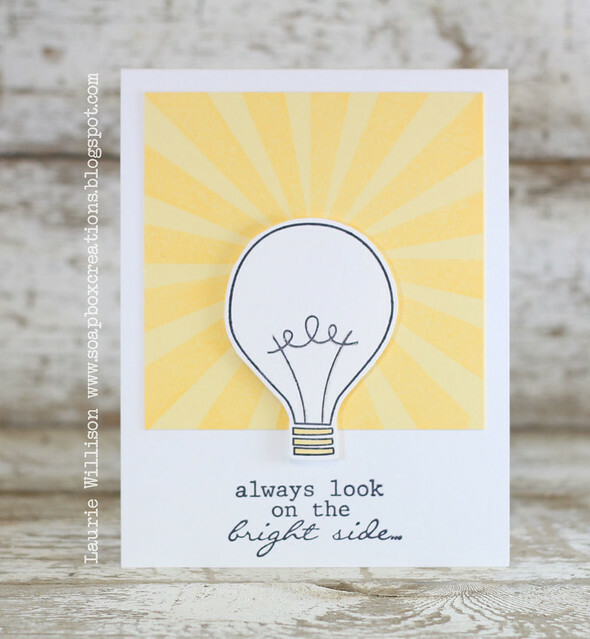 The line and sentiment are from a new Simon Says set called Absolutely Delightful. So fun! The sponsor this week is Amuse and they have an amazing prize for this weeks CAS--ual Fridays Winner. Head on over to the blog and check out all the deets. You can also see the Girl Fridays' cards over there too! I can't wait to see everyones blog header inspired cards! Thanks for stopping in! OH, stay tuned for some FUN FUN stuff headed your way. A little CSS release in the works with something I. can. not. wait. to. share. ;) Just sayin'! I am thrilled to be able to share with you about a new Challenge that will be starting October 11th. I'm so excited about it, that I already have my first 2 cards done for the first 2 challenges! :) Tune in October 11th for the first round! 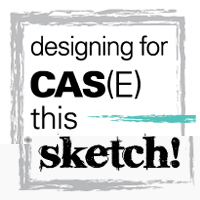 Stop over to the CAS(E) this Sketch blog to see who the other DT members are! 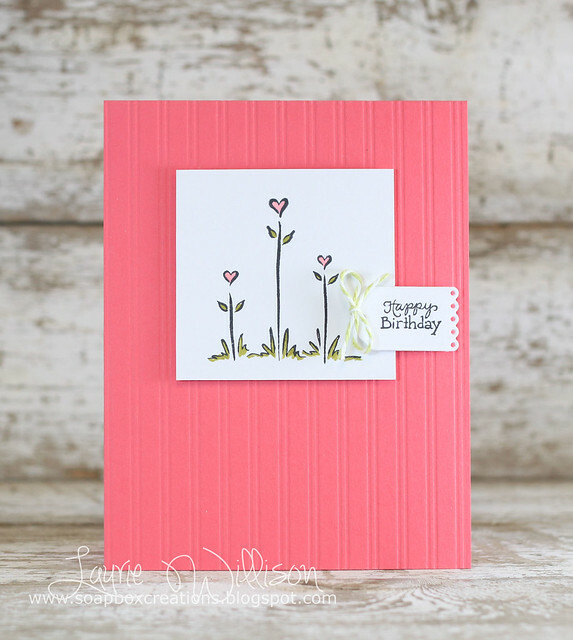 Don't forget to stop by Steph's blog and see what fun thing she has created! If you are in a slump too, take our challenge and just go make something! I find that in order for me to create, I have to have a clear space. I did that last night and this morning and was able to get back into the groove! Leave a link in the comments if you would like to share! Hello! It's time for another Retro Sketch! This one is a CAS sketch from Wendy's original card you can see HERE. You know how I always have to change things up a little. There is a cute banner at the top of the sketch but I switched it out with a word. Always changing things up, I know! I used my Cameo to make this little hello file. I also made a video on how I did this.... but I have this phobia of sharing videos. :) I ran the whole piece through with the Linen Impression plate after I cut it out and then added one more layer, impressed that as well, just for a little more dimension. I stared at this card forever thinking about what I needed to add to it. Then I thought I should go back to square one. Then I decided to go ahead and use it and leave it alone. Plain? Needs more? Any thoughts? ETA: OK I got a few emails....I am adding in my video! I hope its helpful to some of you! Its super simple! I hope you can join us! Go check out the Retro Sketch blog to see what the other girls have made up for us and then link up your creation too! I'm getting together today with a group of DeNami friends, to wish Nami a Happy Birthday! If you are following along on the hop, you would have stopped her from Tina's blog. If you would like to start back at the beginning, click HERE. Nami, I hope you have a very happy day! Thank you so much for everything! All of you at DeNami are truly amazing! The last stop on the hop is my sweet friend Paulina! I am sure she has something adorable for her mom! I am ready for these fall colors and the cool air, sitting on the deck, bar-b-ques. Yes. Favorite time of year hands down! My card was pretty easy to make. I just took 4 colors of Versa-magic and sponged them in layers on the card base, masking of the top and sides so it only colored where the leaves would be. Then I cut this image out with my Cameo....I got it from the Silhouette store....and then ran that top piece through with the woodgrain plate. I added a little WMS sentiment from Teeny Trees on vellum to finish it off. 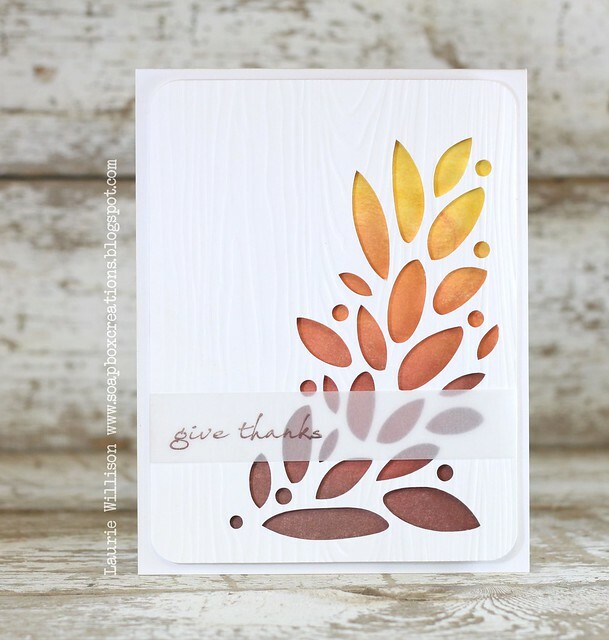 I am so in the mood to make some more fall type cards! I can't wait to see yours. I hope you can play along and link up this week! Check out the CAS-ual Fridays blog to see more Fall projects and check out our sponsor for this week! 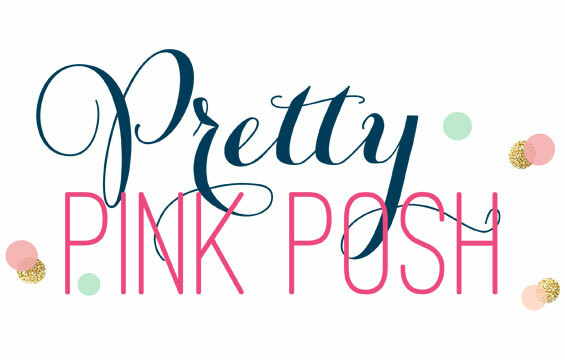 This is my first WMS blog party, so I'm pretty excited today! I have some blog friends who play along quite often and have great things to say about this amazing company, so I had to join in the hop too! I masked off a rectangle section with sticky notes and added in the sky with my Copic airbrush. The grass is a chunk of the Cupcake Die from CSS. Then I stamped the tree and the leaves in fall colors. I added the perfect fall sentiment from the same WMS set. You can go check out all of the fall creations over at the Waltzingmouse blog or to join in you can check out this post HERE. I'm so glad you stopped in today! Have a great Monday! I picked 3 colors I don't usually use together and then stamped Swirls and Stitches in Fresh Snow ink. I added a sentiment from FF #11 (all from PTI) and that's it! Super simple! I am really excited to be playing along with a challenge. It has been awhile since I've linked up anywhere. It was originally a whole card, which would have been fun, but I had to add some more color and detail to it. I have said it before, but I am so glad I kept all my textured Bazzill...I didn't use it for a couple years at all and thought about getting rid of it...because now it works so well with this machine and it gives it just the right amount of texture. Thanks for coming by today! Hope you have a fun Sunday! Those little vellum pockets, I made using my Cameo. They are actually CD holder pockets and I shrunk them down to 1"x 1" square. I glued the side shut with Glossy Accents. You can't even see the glue through the vellum. Then I added these little Clear and Simple hearts from the Wrap-A-Round set along with a Love sentiment from the Cake Decorating set. 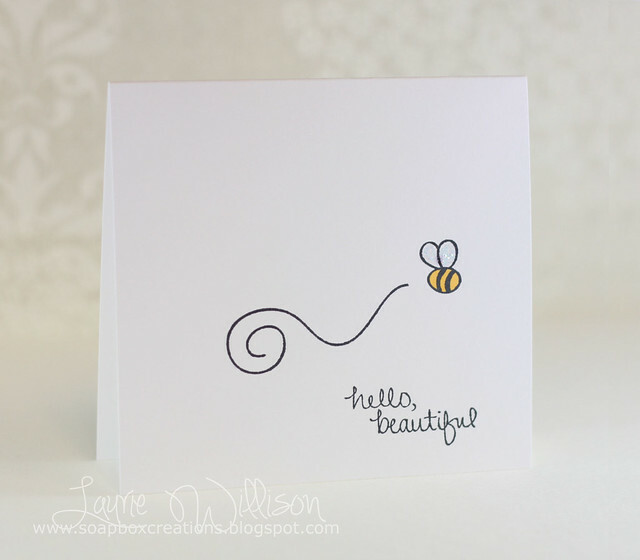 Head on over to the Retro Sketches blog to see what Arielle and Kasia have made for us. Don't forget Wendy is our headliner this month and she has a super cute take on this sketch to share too! Hope you are having a great weekend! Thanks for stopping by! 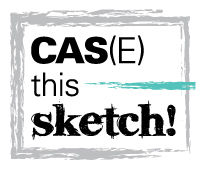 It's CAS-ual Fridays challenge time again and you can't go more CAS than this right? Hope you have a great weekend too! Thanks for stopping in! 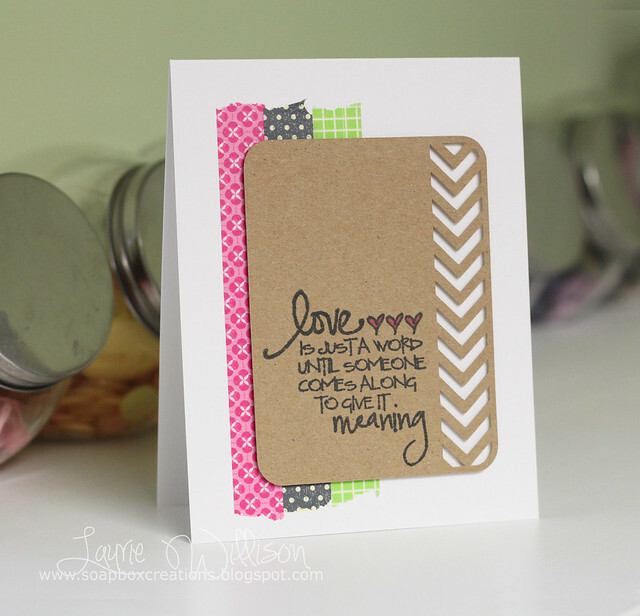 I stamped the sentiment on Berry Sorbet cardstock, with Berry Sorbet ink. Then I used Berry Sorbet Saddle Stitch...it's been awhile since I've tied a bow! It's all layered on a kraft card base. The sentiment comes from the new Absolutely Delightful set. This fun floral paper is from THIS dear Lizzy 6x6 pack. LOVE! Happy Saturday to everyone! This is my 2nd post so scroll down to see my Guest Designer post for Cameo Spotlight! If you have a Cameo...you'll want to play along for sure! I used some Lawn Fawn paper on the card base and then added in a polaroid with some sparkly vellum behind it. The sentiment is from Hero Arts and then I added a fun little element from American Crafts, Cabana line. I added in a little banner tail using a Clear and Simple banner die in Raspberry Fizz card stock. IF you check out the Retro Sketches blog today, you can see what Arielle and Kasia have for you. We also have Wendy joining us this month and she has something adorable to share! I was recently asked by the sweet Jackie, to be a Guest Designer over at the Cameo Spotlight...Yay!! I bought these shapes while back from the Silhouette site and was so excited to put them to use. 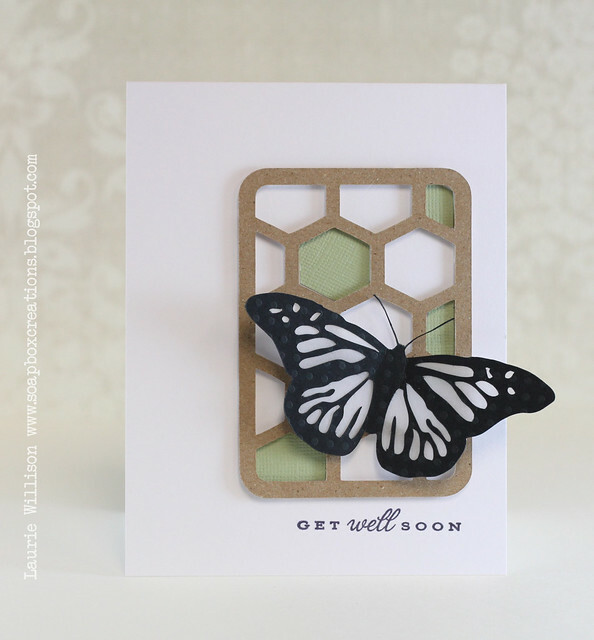 I layered the hexagon card to the card base with foam tape and then added in a little of the sage green color behind. The butterfly I cut out with black polka dot paper...the dots are a dark gray color...and then layered vellum behind. Can you believe those antennae? The Cameo cut out that small detail SO well! I can't wait to see all the Cameo creations this week! I know the DT has lots of fun stuff for us to see. Go check it out over at the Cameo blog and then link up your creations. Thanks for stopping in! 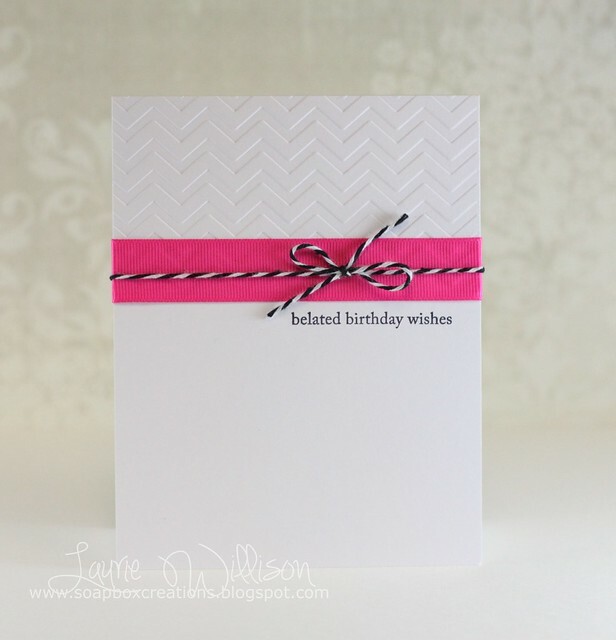 ETA: In my CAS-ual Fridays post, I used a chevron embossing folder and didn't add a link. (Click HERE to see that card) I have had lots of comments and emails about where to get this fabulous folder....click HERE to check it out! Wowza! It's that time again! Since I saw you last...and why my blog has been kinda quiet...I have been in Colorado visiting my sis. I had a great time with gorgeous weather and I can't believe it went so fast! I just got this amazing Chevron Embossing folder in the mail when I got home. I LOVE chevron and had to have this! When I saw it online, I ordered it right away! I added in some Neon pink grosgrain and some Twinery twine. I kept it simple by adding a small sentiment in black ink. Stop over to the CAS-ual Blog and see what this week's prize is. 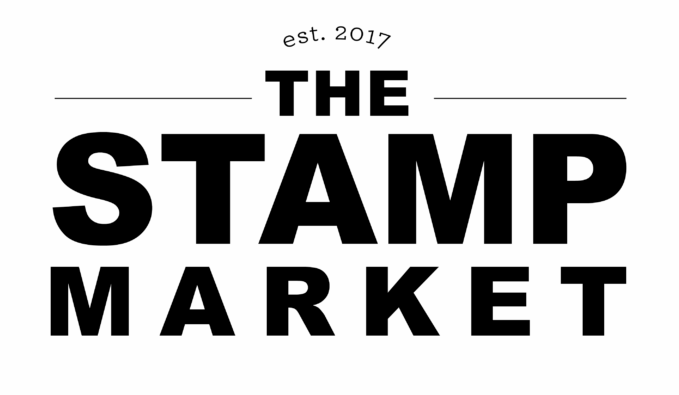 Our fabulous sponsor is Simon Says Stamp. I think there may be a little Guest Designer spot to check out too! I have had lots of comments and emails about where to get this fabulous folder....click HERE to check it out! 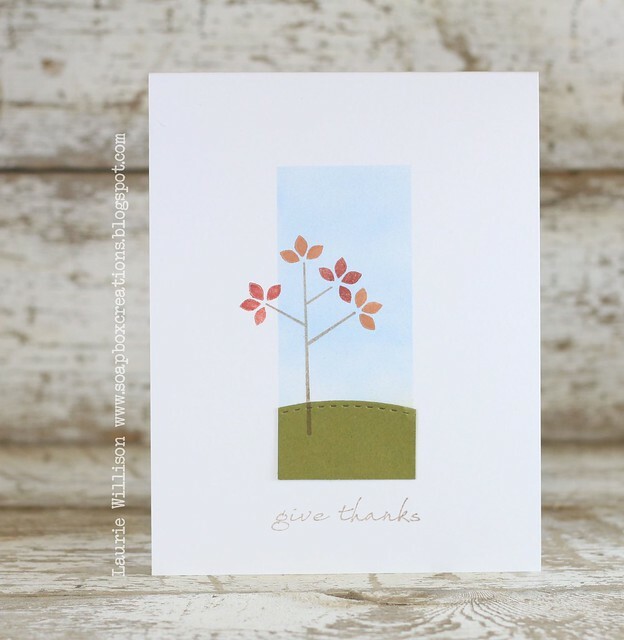 I used a fun little Silhouette shape for the focal point, along with a sentiment from the latest Verve release. I layered it on top of some Washi tape. I simplified a layer in the sketch, adding the chevron detail and the sentiment all in one layer. Super simple! 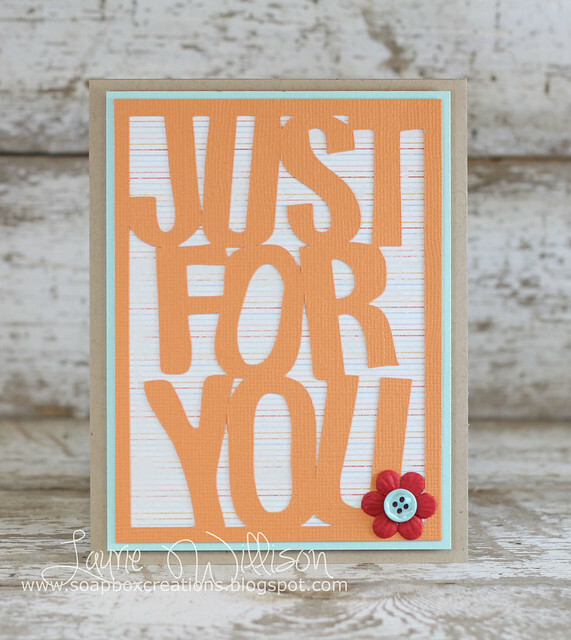 You must go check out the Retro Sketches blog to see Arielle's and Kasia's cards. We have a new headliner this month too! Wendy Fredrick will be hanging out with us. I can't wait to see her creations! Please forgive me for not adding links. I am blogging from my phone this morning. I will stop back soon and add them in. Thanks for coming by today. Have a great day!